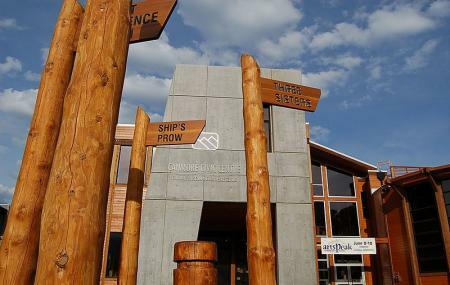 Find hotel near Canmore Museum And Geosci .. The Canmore Museum and Geoscience Centre (CMAGS) in Canmore presents over 120 years’ worth of local history. This museum was started as a school assignment in 1936 but continued to collect various artifacts over the coming years. From Coal to Community, Lime in the Valley, and The Fossils Around Us are some of the exhibits that you can check out at this museum. Wonderful little place to bring the children to. Suggested for children between the age of 4-8. A scavenger hunt is available for the children's entertainment. Staff are fantastically friendly and welcoming. Definitely a place to visit as a family outing. Super cool place! Worth the stop, see the museum and then the gift shop. Free parking lot a block away! not bad. there is a life size bison taxidermy in the building not in the actual geoscience museum but in the same building. ifound that very interesting. Quaint. I work at a mine so it was very cool to see the mining equipment from the old days. Limited in size and scope but a nice!